The purpose of this section is to review ceramic tile and its characteristics including color, size, finish, properties, maintenance and other pertinent information that you may need in order to make an educated decision on the choice of ceramic for a interior or exterior mural. Should you be using ceramic as a surface application, searching for a custom mural, or just curious about the material, we invite you to review this section of our site. A ceramic tile is a manufactured piece of hard-wearing material manufactured from clay. Ceramic tile is used for covering swimming pool and spa interiors and building exteriors and interiors. Ceramic tile is often used to create murals. The word 'tile' is derived from the French word 'tuile', which is derived from the Latin word 'tegula', which is a roof tile composed of baked clay. Shapes range from square to a wide variety of geometrical and freeform choices. Tile mosaic shapes are square, circular, geometrical or handcut. The tile face is either glazed or unglazed. Ceramic tile mosaics may be manufactured and cast or handmade rolled and cut. Ceramic tile that is used for wet areas is made more slip resistant by adding sand to the glaze top coat, or by pressing grooves or creating a texture on unglazed clay before the kiln firing. Ceramic tile slip resistance is also governed by the number of grout joints. The more joints, the higher the slip resistance. Glazed ceramic tile that is used on floors wears over time. A low fire glaze will wear quickly and a high fire glaze has a longer life expectancy. Eventually, all glazed ceramic tile, when placed on a floor, will scratch, pit and wear down. Kiln fired ceramic glaze is water and acid resistant and does not need to be sealed, in contrast to stone which, when used on a floor, must be periodically sealed. Grout joints need sealing unless epoxy grout is used. Ceramic tiles have dye lot numbers. When choosing a tile for your installation the same dye lot number must be chosen. Kiln firing temperatures vary, which affects the color tone of the glaze on the tile. It is important to order 10% or more extra tile than the amount calculated for use. Art tile is glazed with artwork on the top surface or the tile is considered to be 'art' tile because it is unique in size, style, texture and/or color. Mosaic ceramic tile is the art of creating images by assembling small pieces of tile. The small pieces, each typically a different color than the other, are used to create a pattern or picture. Art and Mosaic tile techniques are covered in the Technique section of this site. Glazed brick was used to create the Ishtar Gate of Babylon (ca. 575 BCE), a truly gorgeous work of art. Glazed bricks and tiles were used in Persian architecture and throughout the Islamic world. During the Ottoman Empire of the 16th and 17th centuries, palaces and mosques were decorated with ornate, intricate ceramic friezes. Islamic Spain influenced the creation of Azulejos ceramic tiles and murals. Azulejos is a form of Portuguese or Spanish painted, glazed tilework. Ajulejos is prominent in the art of modern Portuguese culture, and has continued for five centuries. Azulejos is used today to create small and large painted scenes on tile. The popular colors were blue on white. Delft tiles were characterized by single tiles with a blue painted design over a white base of ceramic. Moroccan brightly colored tiles were also invented. Photoluminescent tile is a porcelain ceramic tile that is kiln fired with a glow ceramic glaze. There are many glaze colors available. Yellow and blue glow the best. Art and patterns are applied to this type of tile using the silkscreen method. Tile techniques are covered in our Technique section. Saltillo tiles vary in color and shape, but the majority of the clay bodies are hues of red, orange and yellow. Saltillo tile is considered to be a product of Mexico. This type of tile originated in the Mexican city of Saltillo in the State of Coahuila. Saltillo tile is highly porous and soaks up liquid easily. Glazed saltillo is used for handpainted glazed decos and murals. Saltillo is used in warm climates only as it is not frost proof. The most common, least expensive and least durable ceramic tile body type is a low fire clay. This type of tile is used for wall applications only. Glaze is fired onto the tile to seal the surface. The underlying clay body absorbs water. The body of the tile is quite fragile and is not floor rated. This type of tile offers an almost endless variety of shapes, thicknesses, sizes, textures, finishes and edge treatments. The clay body is almost always off-white. Color is achieved through glazing. Low fire clay wall tiles are not Frost Proof. They are UV Proof due to the kiln fired glaze coating. Quarry tile is a more vitreous type of ceramic tile. This type of tile may be used with or without glaze. Quarry tile is usually 1/2 to 3/4 of an inch thick. The usual size is 6" x 6", 8" x 8" or 4" x 8". The clay body is typically red, tan or grey. Other colors are available by tinting the raw clay body. Frit may be embedded in the surface of the clay before firing to improve slip resistance.The application of glaze to the surface widens the variety of decorative and artistic options available. Quarry tile is used extensively for flooring and commercial high traffic flooring. Not all quarry tile is Frost Proof. Porcelain is the most durable of all ceramic tile body types. Porcelain ceramic tile has a water absorption rate of less than 5%. Porcelain is used for all wall and flooring applications, interior or exterior. Kiln fired porcelain clay tiles are UV Proof and Frost Proof whether unglazed or glazed. Fired porcelain is a very hard, dense material. It is considered 'virtreous' when high fired. This low porosity (water absorption) also makes it stain resistant. 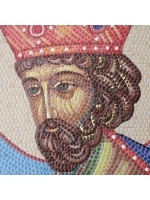 All of our mosaic tile murals are created using porcelain. Finish is governed by the glaze and the tile texture. Tiles vary from smooth to rough. Glaze finishes are either matte, semi-gloss or gloss. Tumbled-look tiles are typically matte. All three finishes may be used for mural work. Gloss glazed tiles are not a good choice for flooring due to the lack of slip resistance and susceptibility to scratching. We use glazed tiles for our mural work. Ceramic tile is used for floor and wall cladding (both interior and exterior) and is suitable for both residential and commercial installations. Some applicable installation uses are kitchen flooring and backsplashes, swimming pools and spa murals and waterlines, swimming pool cladding, building facades, hotel and motel lobbies, carpets, medallions, borders, countertops, fireplace faces and surrounds, spas, fountains, water features, bathroom floors, vanity tops, tub surrounds and showers. When you are ready to purchase a ceramic tile, it is important that you purchase the right amount of field tile and proper trim pieces at the time of your purchase. We offer field tile by Fujiwa and National Pool. We recommend that you buy 10% more tile than you actually need to cover breakage and cuts during installation or to replace a broken tile at a later date. If the design is complex, laid on the diagonal, or will involve an unusual amount of cutting, we recommend ordering 15% + more. It is good to graph out your installation. Exact measurements and detailed drawings are important for a successful installation. This will help you avoid shortages of material, too few trim pieces, etc. resulting in a delay of your project completion. Large custom orders may take four weeks to arrive. Be sure to plan ahead. The usual turnaround time is typically two to four weeks. Before hiring a professional stone or tile installer, be sure to ask for references. Good installers carry project portfolios of their work. Be sure to call on their former customers to check on their workmanship, timeliness, cleanliness, courtesy and price. Should you decide to install your tile yourself, good reference installation books are available at the corner Home Depot or Lowe's. Special materials, such as Saltillo, may require the experience and skill of a professional. After spending good money for a quality product, you may not want to take a risk by spoiling it with poor craftsmanship or an inadequate substrate. Tile is typically easy to install using thinset. Tile may be cut using a diamond wet saw with a new blade. Tiles can be cleaned with any household non-abrasive cleaner and a soft cloth or sponge. Glazed ceramic tile does not need to be sealed. Acidic cleaners will etch the glazed tile surface and will eventually erode the grout, making cleaning and maintenance more problematic. This is especially true if using acid cleaners on sanded grout installations. Using acidic cleaners can permanently damage colored grout. Some mistakes can be irreversible, always check labels on any product that you are thinking of using and test an inconspicuous area first for effect. Agape Tile offers field tile from National Pool Tile, Fujiwa and DalTile. Our murals are created using a proprietary glazed porcelain. Murals are either 3/8 inch glazed ceramic porcelain mosaic or shattered glazed porcelain. Please see the TECHNIQUES section of this site for a complete overview.